Albee’s career as a writer has been accompanied by an increasing concern with the practical medium of theatre. From the outset he championed theatre in America, and has actively promoted new work, both his own and that of other, predominantly younger, dramatists. In more recent years he has become active as the director of his own plays. This is consistent with a shift in the position he adopts towards performance. 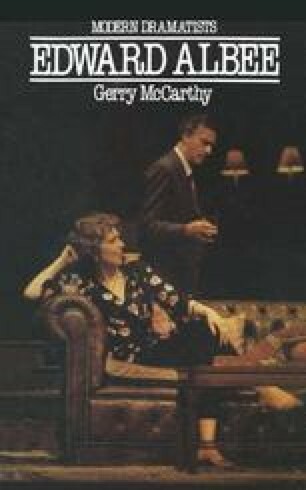 In 1963 he felt that the ideal performance was the one he had experienced in his own imagination: ‘There is only one true, correct, hard, ideal performance of a play, and that is mine, and I saw it when I was writing.’21 By 1978, when he was engaged in a tour of five of his early plays, he was no longer prepared to leave the ‘ideal performance’ as the property of the writer, and evidently felt dissatisfied with the sort of direction to be seen in the theatre: ‘I think I can get clarity and precision by directing myself. The direction may not be flashy but I’m not really interested in flash.’22 The qualities which Albee speaks of complement his articulate style of writing. Although to many his plays are so literate they seem to offer as much to the reader as to the theatregoer, one should not confuse theatricality with what Albee calls ‘flash’.